Blood: The Last Vampire is about a mysterious girl known as Saya , who is part of covert government agency that hunts and destroys a species of vampire-demons. She is half-demon and wielding a samurai sword. 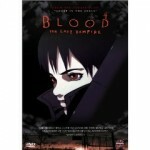 This live action movie is based on the 2001 anime Blood - The Last Vampire . The trailer for this movie looks awesome! There is a kind of Blade feel to it. Vampires and martial arts in one movie… this looks like a must see for fans of vampires and wuxia films. I can’t wait until this movie hits the U.S. Right now it has an international release schedule Japan 29 May 2009, Hong Kong 4 June 2009, Singapore 11 June 2009, South Korea, 11 June 2009, Ireland, 12 June 2009, France 17 June 2009, UK 19 June 2009. Sony has picked up the U.S. rights and is planning a possible summer distribution through Samuel Goldwyn Films.